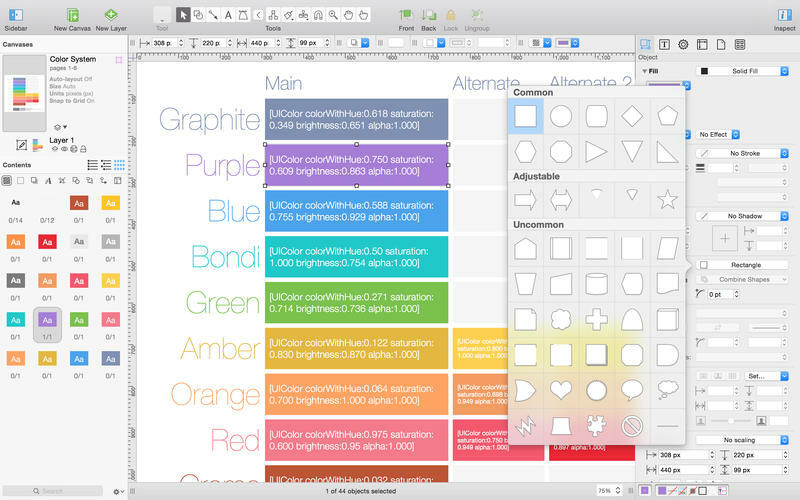 OmniGraffle Pro 6.4 – Create diagrams, flow charts and more. For trackpads that support Force Touch, OmniGraffle now offers haptic feedback when snapping to guides and connecting directly to magnets. Added a paragraph to the documentation about Option-Command clicking through a resize handle to get at a vertex point beneath it. Image assets in segmented controls should now be vertically centered in proper fashion when running on Mac OS X 10.11 El Capitan. [Pro] Fixed a text encoding issue when importing certain Visio documents. [Pro] Fixed a Visio related regression when opening files that had EMF or WMF images embedded in them. Fixed a leak involving multi-canvas documents with links between canvases. Fixed a crash when zooming in past 1300% on documents that had complex PDFs placed on the canvas. Fixed a crash when exporting a multi-canvas document resulting in an error. Fixed a possible data corruptor when sending in feedback and obscuring text. Next story NoteAbilityPro 2.620 – Music notation package. Previous story Mach Desktop 2.7.2 – Use Quartz Compositions, videos, or Web pages as wallpaper. Sketch 41.2 – Design app for UX/UI designer creating iOS & web interfaces.